Zehra is using Smore newsletters to spread the word online. Domain Eukarya: All animals have a nucleus per cell and also are multi and single cellular. Kingdom Animalia: All animals are multicellular and lack cell walls. They are also heterotrophs, which means they consume other organisms to get their own energy. They also have the ability to move at some point in their life. Phylum Chordata: They have a closed blood system, complete digestive system, bilateral symmetry, and most of the time they have an endoskeleton. Subphylum Vertebrata: They have a backbone and digestive system with large glands, liver, and a pancreas. Mostly, they also have a moving ability by muscles joined with the endoskeleton. Class Mammalia: They have hair at one point of their development,have a highly developed brain, and a palate separating air and food passages in the mouth. Most of them also give birth to live young. Order Primates: They are mostly recognized by their characteristics of their skull, teeth,and limbs. They also have large brain cases, a radius and ulna in the fore limb, and a tibia and a fibula in the hind. Family Hominidae: They are omnivores meaning that they eat both meat and plants. Mostly males are larger than females in weight and height. They are also known for being arboreal, meaning that they mostly live up in trees. Color: They range in colors from bright orange and maroon to dark brown. Diet: They eat mangos,figs,insects, bark,leaves, and fruit. Predators: Humans are their only predators. They are destroying their habitat by cutting down trees. That's a reason why orangutans are on the endangered species list. Habitat: They live in tropical rain forests,hilly lowland areas, and terrains with dense tree growths. 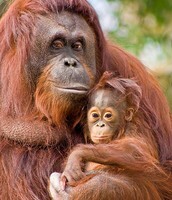 To find the orangutan in it's natural habitat you will have to go to the island of Sumatra or Borneo. Take cover, don't want my hair getting wet! 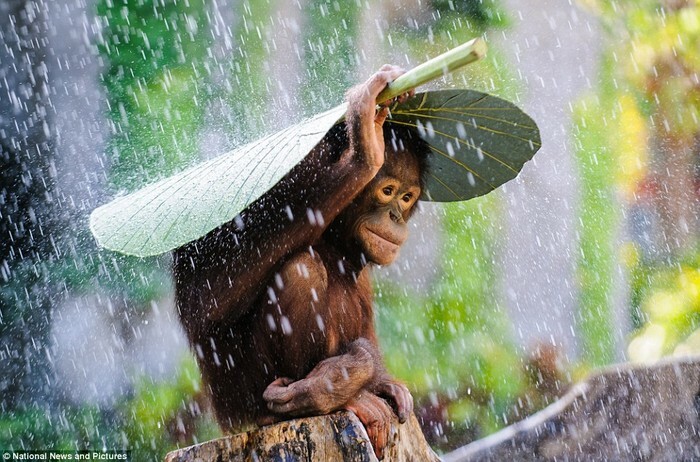 Orangutans use leaves to shelter themselves from the rain. 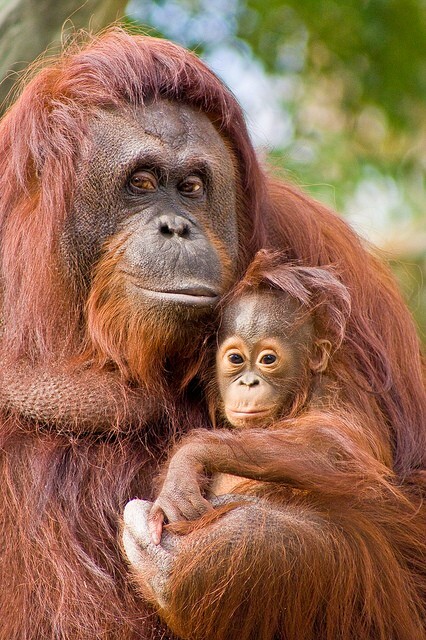 Babies stay with their mothers for six to seven years. They leave when they know how to survive on their own. 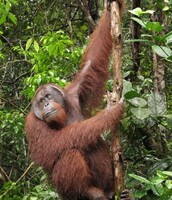 Orangutans are arboreal meaning that they live among trees. 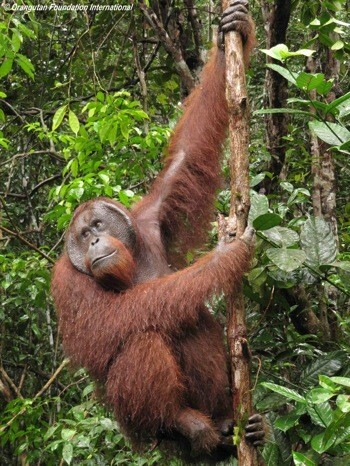 Orangutans have long arms( 7 feet) which help them swing from branch to branch, that makes them arboreal. Their flat nails help them grip objects much easily and the big cheek pads help them give off "long calls". The young stay with their mothers for six to seven years until they learn how to survive on their own. They make howling noises to keep other males off of their territory and to tell others "who's boss." They look for food at day time while in the night they rest. They also use leafy branches to build nests for them to sleep in and use big leaves to shelter themselves from the rain. Burton, M., & Burton, R. (2002). Orangutan. In International wildlife encyclopedia (3rd ed., Vol. 13, pp. 1797-1799). New York, NY: Marshall Cavendish.